(di Niamh Fleming-Farrell, per The Daily Star). 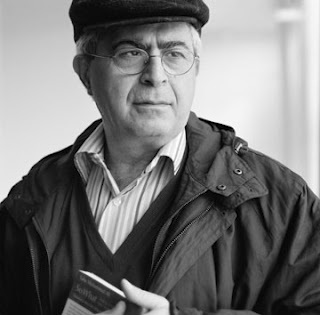 Lebanese novelist Elias Khoury has no intention of setting his next novel in the Arab Spring. From behind his desk at the Institute for Palestinian Studies, he explains that for him, literature and reportage are not interchangeable. Published in Arabic last January, his most recent novel, “Sinalcol,” is set in Beirut, Tripoli and Homs, but the work was conceived long before the events that led to the January 2011 ouster of Zine al-Abidine Ben Ali. Similarly, the idea for his present fiction project predates the revolutions. “Of course,” he adds, “I don’t know how the events in the Arab world will affect my writing. Maybe I will not write about them but they will affect my style. So things are much more complicated, but I think that writing literature is something much more serious than writing about current events … It is a very deep thing which is a dialogue with your time and a dialogue with the dead. Khoury is, foremost, a novelist. Yet over four decades and 11 novels he has established himself equally as an academic and a political commentator. His commitment to the political left placed him among the intellectual founders of the Democratic Left Movement, which flourished in the wake of the 2005 Hariri assassination and the departure of the Syrian military presence in Lebanon. Furthermore, the subject matter he has taken up in his novels has made him, for many readers and critics, an exemplar of an art that, while not subordinated to politics, is informed by it. Perhaps his most widely read novel, “Bab al-Shams” chronicles the lives of a cluster of Palestinian refugees in Lebanon. Lauded as a subtle dismantling of notions of history as political polemic, it was written after reams of interviews with Palestinian refugees in Lebanon, a project that, in other hands, might have come to little more than journalism. No surprise, then, that the novelist has opinions about the Arab Spring. As a 22-year-old marching into a publisher’s office with his first novel under his arm, Khoury admits, he was arrogant. Today he says with some humility that he has much to learn from the Syrian youth whose actions triggered the ongoing uprising against Syria’s Baath regime. A consistent advocate of secular democracy, Khoury says he and his fellow intellectuals have found themselves in the midst of something unexpected. He says it’s “premature” to speak of the “outcome” of the Arab Spring. “This speaks a lot, not only about the Arab avant-garde, but about our post-modern times,” he suggests. “Maybe the Arab revolutions are one of the first signs of this profound change. You don’t have a planned project, you don’t have a structural analytical approach, you have just aspirations,” he says. Khoury believes that he has a lot to learn. “I have to reinvent my brain and analysis in order to understand and be part of” the change in the Arab world. “We cannot not be part of the process,” he adds. Voices in the international media have tended to amplify the fears of secularists in countries like Tunisia and Egypt who – observing the strength of conservative Islamist parties on the post-revolutionary landscape – have expressed anxiety that Islamist-dominated governments may curtail freedom of artistic expression more than the regimes they’re replacing. In reference to the rioting that broke out on June 10-11 in response to an art exhibition in the Tunisia suburb of La Marsa that left some artworks ruined and other properties damaged, Khoury says the media is a major problem. “In all the media I have seen until now,” he says, “I don’t know what is the problem. What is the exhibition? I read all the newspapers, I watched all the Arab satellites. Nobody spoke about what is the issue that brought the Salafists in Tunisia to the streets and created all these problems with the government of Ennahda. “This is something that was put on the Internet, I don’t know by whom, which created a big fuss. I don’t know why,” he says. “The Free Syrian Army has nothing to say about Adonis being put to death … If they wanted to put him to death, they would have killed him,” he affirms. The Lebanese novelist embraces dialogue between secularists and Islamists. “We have to recognize [the Islamists’] existence, but we have to push the political debate from [one] about identity to [one] about political programs,” Khoury says.